According to a new scientific study, which analysed Wikipedia using a series of algorithms, Madonna is the most influential woman in history - ranking above men such as Jesus, Charles Darwin and Barack Obama. 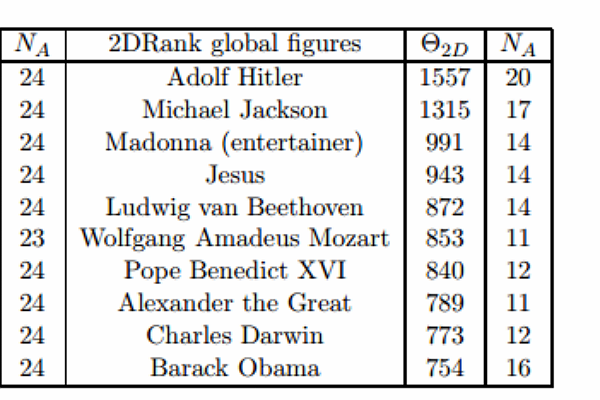 The list, published by a group of researchers at several European universities, used the same system Google uses to evaluate top search results, and applied it to Wikipedia to discover the most influential people. According to the "2DRank" section of their findings, the most influential woman in the world is Madonna, who is ranked shortly behind Michael Jackson and, worryingly, Adolf Hitler. The paper also published a list of influential figures using a slightly different algorithm, and Madonna is the only woman, out of a total of twenty global figures, to make it into either list. The study also ran a separate list that comprised only female figures, and Mariah Carey and Britney Spears made it into this one. Madonna has released thirteen albums to date, the first of which was released over twenty years ago in 1983. She has also appeared in several film roles, written books, and runs a clothing line.